Ribbed Anti Scratch PVC Strips for doors are common in high traffic applications. The ribs on the strip are off-set on 2" centers and exhibit an extrusion that projects out from the strip approximately 1/4". These extrusions act as a buffer when machines hit the plastic pro-longing the life of the material. When a forklift or machine hits the plastic the machine first makes contact with the ribs which prevents the inner portion between the ribs from touching the machine and thus scratching (common with smooth strips). Clarity is maintained for a longer period of time in comparison to smooth strips. Ribbed strips also offer less drag when gliding over product and pallets since the strips only make contact on the ribs ( less surface contact ). Ribbed strips do not stick as easy as smooth strips and typically hold up better in windy conditions since the ribs lock against each other. View More In Entry Doors. 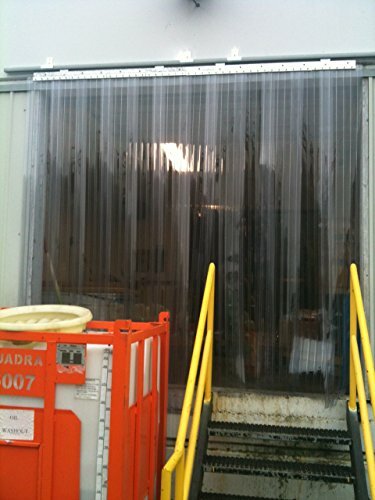 If you have any questions about this product by Strip-Curtains.com, contact us by completing and submitting the form below. If you are looking for a specif part number, please include it with your message.